André Cognard was born in France in 1954. He was 17 years old when he started teaching aikido to adults, by opening five dojos in several cities in France. 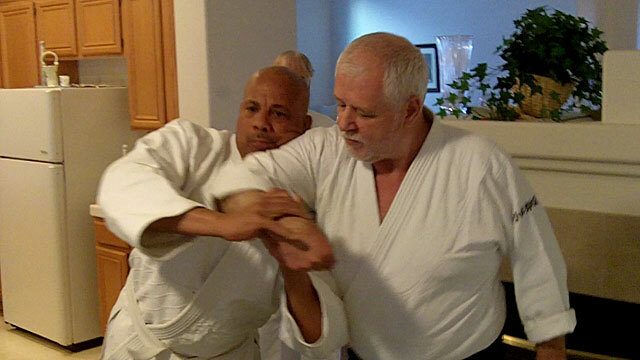 Four years later, he received the French state diploma for teaching judo, aikido, karate and kendo. 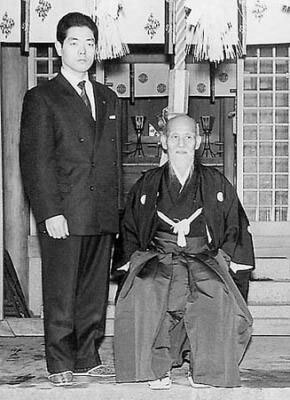 In 1973 he met Hirokazu Kobayashi Sensei (1929-1998), a direct disciple of O-Sensei Morihei Ueshiba. 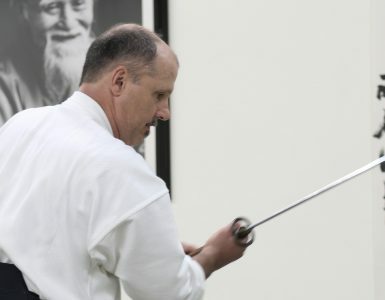 After twenty-five years of practice under Kobayashi Sensei, André Cognard was designated Kobayashi Sensei’s successor as head of the Kokusai Aikido Kenshukai Kobayashi Hirokazu Ryu Ha. In 1982 he founded the Académie Autonome d’Aikido, where aikido is taught by traditional means as well as with theoretical support from psychology, philosophy, and western and eastern medicine. 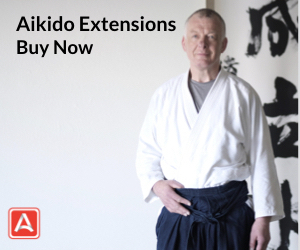 In 2003, he opened in Bourg Argenal, France, the Kobayashi Hirokazu Kinen Aikidojo, traditional dojo devoted to his master and venue for the Instructors Training Courses. Cognard Sensei directs Aikido and Aikishintaiso seminars worldwide, and he is the author of several books on martial arts. He is also one of the highest-ranking representatives of the Dai Nippon Butoku Kai: the title of Hanshi was bestowed upon him in April 2012, at the Fourth World Butoku Sai held at the Butokuden in Kyoto, Japan. 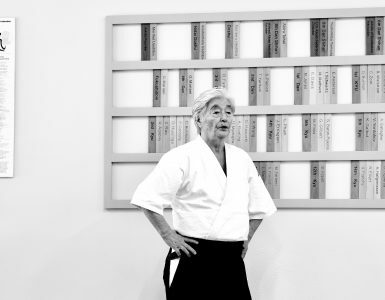 When Kobayashi Sensei went to Europe to give seminars, what were the main themes of his teaching, especially on the mat? First there was a recurring theme and that was that aikido wasn’t Japanese, but belonged to men worldwide. That was really “zen sekai no ningen no mono.” That was an important point. The second important point was that aikido is not what we do to the other, but what we do to ourselves. I teach this at almost all my classes, from a technical perspective, because I think Kobayashi Sensei’s technique evolved immensely because of this. I think there are two kinds of people in aikido or at least two important types. There are those, the temple guardians, who preserve O-Sensei’s aikido. I think Saito Sensei was one of them. He was very thoughtful, very scrupulous, very careful, and very conscious and there are the others that participate in its evolution… I think Kobayashi Sensei developed things considerably. I don’t know if you’ve seen how we currently practice techniques, but it’s quite different. 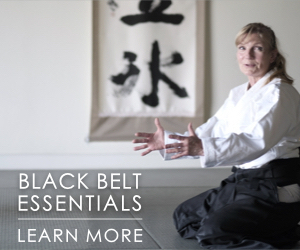 I’ve seen a lot of videos and in today’s Aikido Journal’s newsletter, there’s a video of Kobayashi Sensei. And so it’s quite different, but it’s also the inscription of aikido ethics in the technique. What I mean is doing a technique isn’t doing a nikyo on him, but first and foremost, doing it on myself. Because it’s in me it will be passed on to him; it’s in both of us. This is what he was working on and that I find very interesting. It’s very rich because it gives strength and especially a lot of mobility in between ukes. I was uke a lot, more than anyone with him. I received directly. When I touched his hand – hop – a millimeter here – a hip movement – hop – everything had to be translated, it was great. When he died several questions came to me, but one in particular, who will do his irimi now? When I visualized it, it felt like entering a vortex. It was Walt Disney. It felt like he was sprinkling stardust around us, and I waited for the moment when I would fly. It was wonderful. It was enchanting. It was the first question that came to me when he passed, “Who will do his irimi?” Then I realized it was futile. When I found myself in front of his urn I thought, “No, his voice isn’t in there, I can hear his voice.” It was very hard. In any case he really worked at making the technique directly express the ethics. And this is also my research. I mainly write on this topic: that the techniques transmit the ethics. Even without speaking, even if he said nothing, and that too was very interesting to him, he’d say that even if there were no verbal communication, even if nothing was said, and none of the aikido was explained, if one was to teach someone seriously, and that person in turn taught someone seriously, and so on… three generations later that person would speak like O-Sensei and say the same things without ever knowing him. It would have transpired into their body and created his thoughts. That was his way of seeing things. His work focused on that. He also insisted on many points, for example, he would say, “When you’re grabbed, you do nothing without adopting the other’s point of view. He’s here and looking over there, so you must look over there. If you look in the opposite direction, you’ll never know what he sees and what’s motivating his actions, so whatever you have to do, even if it’s omote, the first thing to do is to take his point of view.” That was really a topic that kept on coming up. It was said each time. There is also a very important point in his teaching: all aikido techniques must heal. And so he’d always explain each technique from the perspective of the energy flow in the body, meridians, etc… Always. For nikyo he would say, “That can’t be nikyo because you’re not controlling the appropriate points. Here, this line is your ancestral energy line that gave birth to you, it must be controlled, and this one that controls the large intestine and is related to your mind must be controlled, and this other one here is your physical strength and is related to your lungs; it must also be controlled. Your nikyo must control these points; if it doe,s you don’t need anything else. You’ll control the center directly. If you don’t control these points, you won’t have access to the center. You will attack the wrist, the elbow or shoulder, but you will not get to the center.” That’s the way he developed all his aikido. He explained each technique, and would say, “Nikyo heals your liver, and sankyo your lungs. When you do yonkyo, do it here because here you’re attacking the myocardium and it’s not good.” Each technique corresponded to a physiological function. It was a very important point in his teaching. He was in contact with a kappo/sappo master who practiced traditional manual medicine for a long time. Yes, the name of the master was Sumida. I didn’t know him; he died before I went to Japan. But he talked to me a lot about him. Apparently, this master treated baseball players with tennis elbows and sumo wrestlers’ injured knees. Because of this, he was very famous. He was one of a few that could. This gentleman was a funny character. He had a very strange diet. Basically he ate flowers. One day he showed up at Kobayashi Sensei’s home saying, “I know who you are. I know you. You’re going to show me your techniques. You show me a technique, and I’ll give you one.” And that’s how it worked. It went on for a while, but I do not know exactly how long. But this man treated a lot of people, really a lot and all the time. Apparently, that’s all he did and what always kept him busy. So nikyo is good for this, this is good for that… and I had to explain, and so I tried. I wrote a book. I studied a large body of research on osteopathy, acupuncture, Mézière physiotherapy to show the relationship between the energy flow and the muscular chains in aikido techniques. It was a tremendous job. I did it because in Europe it wasn’t enough just to say do this, do that. It’s enough with real students. With a real student, it’s not a problem, “Do it, period!” In our school it’s like that. But for the public it was absolutely impossible, so I had to communicate everything, and it was very hard because he never gave explanations, ever. Was Kobayashi Sensei close to Seiseki Abe Sensei? I don’t know. From time to time, he spoke about him and it was always with great admiration and great respect. He also talked about Tadashi Ave. He really liked him. In an interview, Tetsuro Nariyama Sensei said that it was Tadashi Abe Sensei who introduced Tomiki Sensei to Kobayashi Sensei. Is that true? It seems quite likely. I’m not absolutely certain, however, if Nariyama Sensei says so, it’s most certainly true. It seems quite likely because Tadashi Abe and Kobayashi Sensei were very close. He had a great deal of admiration for him. He talked about him a lot. He regretted his absence from Japan. He thought he could have been very helpful. 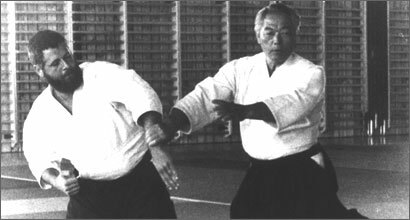 And what about weapons in Kobayashi Sensei’s aikido? Essential. I think Kobayashi Sensei always searched upstream to try and understand what O-Sensei did. 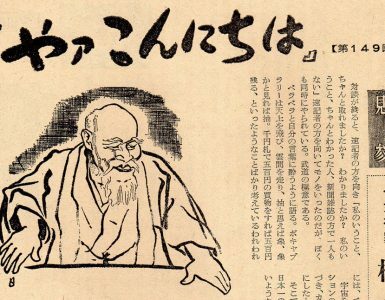 As I mentioned earlier with the Daito-ryu, I think he tried to study, but I do not know with whom… For aiki ken, he referred to the Yagyu Shinkage-ryu. Clearly. As a matter of fact, the ken he used was a Yagyu ken. Later, he created a ken that we still use today. I had a copy made and it is very similar to a Yagyu type though slightly different. His reference was, “In aiki ken the position is sideways”. Why? Because the Yagyu Shinkage-ryu was the first kenjutsu technique that was performed sideways. Then of course he spoke about O-Sensei. But when I look at videos of O-Sensei practicing sword and I recall what we did together, it’s quite different. I do not know when he integrated these differences. But in any case, he was a kendoka; that’s also why we got along because I was also a kendoka. When he arrived, Europe was a wasteland when it came to sword practice. We were happy if they managed to hold their swords in the right hand. It was awful. When he saw me take a ken and I stood in front of him, we understood each other. He was a kendoka, so his use of a sword was serious. So I do not know what came from O-Sensei and what came from Kobayashi Sensei, and what comes from elsewhere. It is very difficult. He forbade me asking questions. I never questioned him, not one question, ever. For him asking a question was an attempt to control the teaching that was given to us. Teaching was on one side, learning what was on the other… “Please?”… “Shhh! There is nothing to ask.” That’s how it was. Sometimes I would have liked to know more, but it wasn’t easy. However, for aikijo, I’m sure he studied in a jodo school because I also practiced jodo and when he arrived in Europe he looked around and he said, “They lean forward, they hold their jo this way, etc.” And to establish positions, what did he teach? Jodo. It was Jodo. He explained his ukenagaeshi using a jo by showing a jodo maki otoshi. 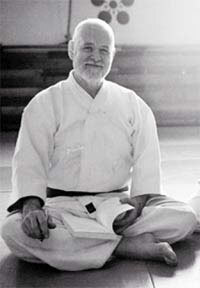 He explained many aikijo techniques using jodo techniques. The way he explained aiki ken techniques aiki ken using kendo. Did he speak of the origins of O-Sensei’s jo? Yes. I heard one thing and that is that O-Sensei had practiced in many schools. He practiced Shinkage Ryu. He even had a Menkyo Kaiden in Shinkage Ryu. He practiced Hozoin Ryu. 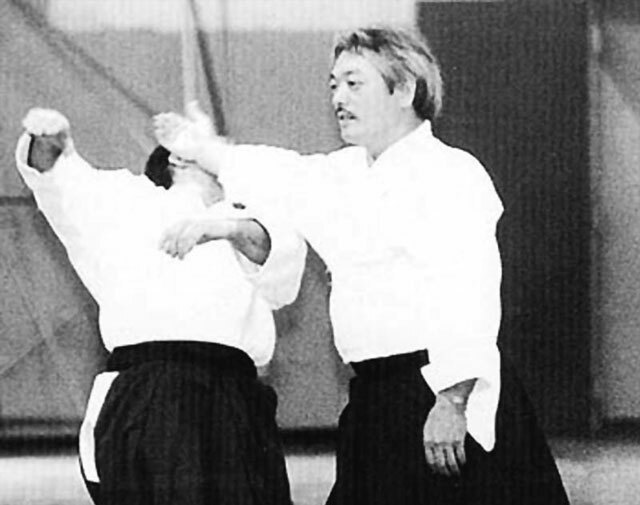 Kobayashi Sensei said that part of the aikijo was inspired by the Hozoin Ryu especially choku tsuki. It is inspired by Shinkage as well. Regarding Daito-ryu, I do not know, you probably know better than me. He said that Sokaku Takeda had not received permission, the Menkyo Kaiden, for the sword and that he taught a sword technique that was personal and came from his family. 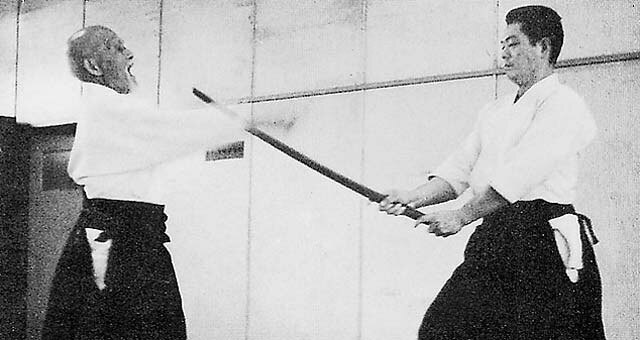 He said that O-Sensei did not practice Sokaku Takeda’s sword technique, but referred to his experiences in other schools. I do not know about this. What we do know is that Takeda Sensei spent six months in Ayabe in 1922, and at that time O-Sensei received the kyoju dairi from Sokaku Takeda, but he also received a Yagyu Shinkage-ryu certification delivered by Takeda Sensei. Yagyu Shinkage-ryu, by Takeda? How is that possible? I saw a photo from Sokaku’s eimeiroku (enrollment books). But what does that mean? It means that Sokaku Takeda practiced Yagyu Shinkage-ryu. It was not his school. That’s extraordinary. I had never thought of that, it’s quite new to me. But when did he teach that, in Hokkaido, during those six months, during a week class? We do not know… (laughs). It is lost to history. For me it is still very mysterious. For many years I practiced kendo and when I saw what we were taught in aiki ken in those groups, they did not even call it aiki ken then, as a kendoka… I knew that when we picked up a ken we could rest. For me, it really didn’t seem serious. But when I saw him use a ken I thought: “Wow! This is a different world altogether.” It was the speed, the precision; it was highly accurate. He realized that during the seminars there were a lot of beginners, so he took precautions. He said, “Don’t stand too close. Keep your distances, it’s the same.” But when we really worked, the ken was there, really. It was really… I don’t know how to say it. I always asked myself and I’m really surprised by what you’ve told me. A degree in Shinkage Ryu from Takeda Sensei that would mean … it would mean that there was a relationship between Takeda Sokaku and Yagyu Shinkage-ryu. Obviously, he was a sword master… and what’s really interesting is that he was ambidextrous. He could handle the sword with both hands, left or right. And he did sometimes, apparently when he was young. I really would have liked a conversation with Kobayashi Sensei. I think it would have been very interesting. He had a vision, he was on the outside; he was free. He looked everywhere. After the war what did he do, where was he? He immediately went to Tokyo. Was his family from Osaka? Yes, his family was from Osaka. But he went to Tokyo, he worked in Tokyo, I have stories, snippets. He worked at the fish market in Tokyo; he unloaded trucks. He told me how he worked so he could take classes. He made a living off of odd jobs. I am very interested in the experiences he had at a young age. For instance, when he was in the Kamikaze program during WW II, he should have died during the war but due to fortunate circumstances he survived. I feel that was a very pivotal moment in his life. Could you talk about these experiences: as a boy during the war and how it influenced his life after? Yes, he spoke to me a lot about it, especially when we were in Japan, in a “Japanese” atmosphere. When we were teaching from morning until night in the universities, in the evenings, we would have dinner with the students and when we’d retire to our room he would often talk about this. It was very ambiguous. On the one hand he regretted not being able to fulfill his mission as if the kami had denied him this right, and on the other hand, he was very happy to have survived and to have met O-Sensei. He linked his experience facing death to the quest that gradually led him to O-Sensei. He connected these two facts, in words, and ideas. And I think that gave him a particular character. Kobayashi Sensei was an extremely strong individual, an individualist. He wanted to follow his path. He didn’t want any interference between him and O-Sensei. His relationship with O-Sensei was unique and he defended, and valued it very highly, while respecting others. In my opinion, it came from his experience of going all the way or almost. And in any case he had decided to die. He was never afraid of anything. He was nothing like the image one might have of a martial arts master, poised, calm, and very wise. He was impetuous, he had a lot of panache and style, and he was reckless. When he saw a motorcycle, no matter which one, he’d get on it and drive very fast. He loved planes. He loved cars. I used to drive very fast, so he’d always say, “You drive better than me; drive and go fast,” and it always had to be faster. And he loved to play. He was a very happy person, very joyful. I think he wasn’t afraid because in a certain way, he was already dead. He absolutely did not fear death. Sometimes, though, he was tormented. I often slept in the same room as him, and I’d hear him scream, I’d wake up, and sometimes he’d wake up too. You said something about Kobayashi Sensei not wanting anything to come between him and O-Sensei. What does that mean specifically? This is an extremely difficult subject because I do not want to create problems or offend anyone. But I’ll try to talk about it a little. Was it in Tokyo or Iwama? I think it was in 1948. But I cannot be sure of that. There was something very strong in his relationship with Japan. His loyalty toward Japan was incredible. For example, he spoke to me a lot about the imperial family. It was very important for him. The tenno (emperor), the Japanese soul was very important. He had a feeling, you know it very well, yamato damashii; it really meant something. He was very Japanese. He was also a universal man; he was very open. He had no intention of establishing Japan elsewhere but he wanted Japan to be really authentic. After the war, O-Sensei was troubled by its consequences and how the country had suffered, all the destruction. He criticized the prewar policy responsible for this result. Did Kobayashi Sensei share the same ideas? There are Japanese of his generation that believe that it is a pity that they lost the war… What do you think? This is also very difficult to address. Kobayashi Sensei was an extremely intelligent and open-minded man. O-Sensei’s feelings of compassion, peace, and universal love permeated him profoundly. In every one of his seminars you could hear a word that meant: the other is not wrong because he attacks, on the contrary. The problem is not the others or ourselves; it’s what lies in between us. That’s what makes us enemies. That’s what needs to be addressed. From time to time Sensei liked to drink and when he had drunk a little, sometimes he got angry, lost his temper and might have fought the war again, a little, but I think it was just his disappointment as a child not being able to… like a wound that reopens. I do not know if I am allowed to say things like this… It is only the truth. After all the truth, he would say, the truth is always best. I do not know much. I know Kobayashi Sensei loved karate. He had started practicing seriously with his instructor and one day his instructor told him, “Listen, this is not your place. I’m sending you…” and he wrote a recommendation letter for O-Sensei. Yes, it was in Tokyo. This is when he was in Tokyo. We’re talking about the late 40’s right? I have heard from Saito Sensei that Kobayashi Sensei spent at least several months in Iwama in the early 50’s. Yes, that is quite possible. I know little about his presence in Iwama. It’s a place he referred to, of course, and he loved. I went there with him. He took me there. Did you meet Saito Sensei? Not at that time, he was not there. I know more about Kobayashi Sensei’s story after, when he went to Osaka, when O-Sensei went to see him frequently in Osaka to work and teach. He talked to me a lot about this period. He was really an Osaka–jin, it was in his blood. He loved his city. There was something about Osaka that was very special to him. He was very proud that O-Sensei was from Wakayama… He told me that when O-Sensei spoke to him, he’d only speak in Osaka-ben. Did Kobayashi Sensei speak about the circumstances of aikido in Osaka in the prewar period? Did he know anything? I know he respected Tomiki Sensei, for example. I think he made a real difference between aikido before and aikido after. 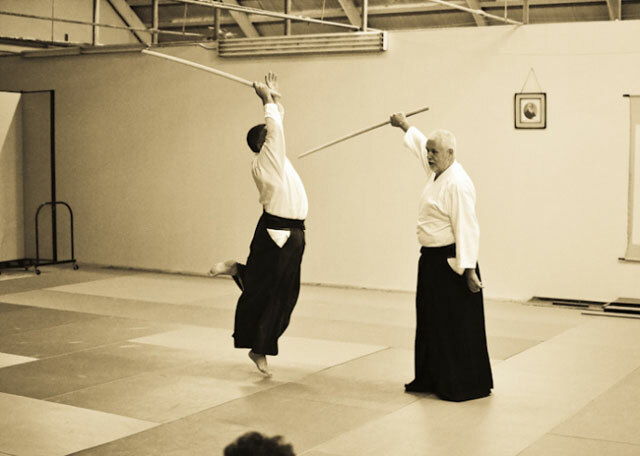 Saying that O-Sensei really had changed his way of practicing, his way of thinking aikido. And for him literally aikido was the aikido of after. But he really respected the people that were there before. I met him very early and I was a bit impetuous and so he had a point view that I liked a lot, he said: “Well, what’s important is that each person has had an experience with O-Sensei and each person has drawn something different from it. 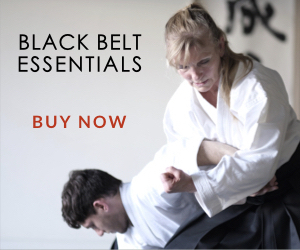 And aikido needs it all. The development of aikido needs all of that.” However, he had his own way of doing things and he also wanted to affirm this point of view. There were two sides of the story and that idea suited me well. As a historian, this relationship between Tomiki Sensei and Kobayashi Sensei in Osaka is really interesting. You wouldn’t think he’d be interested because of the competition. I think he had respect, and I think it was because he wanted to understand better. He often told me, when O-Sensei taught, he taught like that and nobody understood what he was doing. And he’d tell me the only way I could understand was to be uke, because otherwise he’d do things and we didn’t know what. And he wanted to try to understand and to understand he tried to see what had been done before. For example, he was very close to the Daito-ryu Jujutsu. For a while he was a chief instructor of Daito in the Kansai. He was a Shihan. For a while he was very close to Tokimune Takeda. They met frequently, ate together, etc. Did he know the people of Takumakai then? Hakaru Mori Sensei? Takuma Hisa Takuma? I do not know. That I do not know. He often referred to Tokimune Takeda, he even had this project; he asked if I would agree to organize a trip for Tokimune Takeda in my dojos in France. He told me, “Listen, I think it would be really good…” He knew I had lots of students, several dojos, and he knew I could arrange for it to happen. I said, yes, no problem, but it never happened. I think maybe Tokimune Takeda was too old. 1985-86… ’87. I think, around then. I’m trying to stitch together bits of memory. During that time frame, he was in declining health. I do not know the details, but I think Tokimune Sensei went to Osaka to teach the Takumakai group. Yes there are very soft schools. Did Kobayashi Sensei go to Hokkaido? I don’t think he went there to practice. In any case, he didn’t tell me about it. Part 3 of the interview continues here. 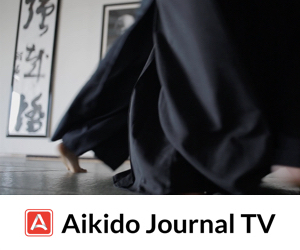 We would like to acknowledge the assistance of Andrea Debiasi for his role in organizing and editing this interview for publication on Aikido Journal. Please see this article for an updated and expanded view into the relationship between Hirokazu Kobayashi, Takuma Hisa, and the art of Daito-ryu. Regarding the comment about the sword master being ambidextrous can you confirm he was referring to Takeda? Even after re-reading the dialogue, it is a little confusing…Takeda/Ueshiba/Kobayashi.